A mature bay windowed semi-detached residence c. 897 ft² / 83.33 m². Standing on a large corner site with tremendous scope to develop and extend subject to planning permission and create a magnificent family home in this much sought-after location. 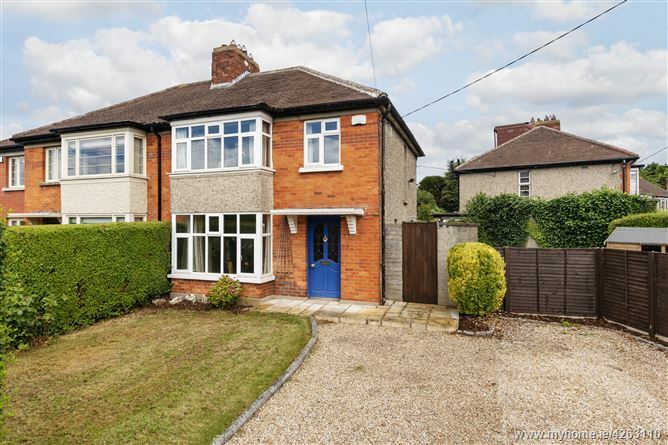 Situated off Milltown Road and within minutes walking distance of local shops, bus routes, Dodder Linear Park, a host of primary and secondary schools, Milltown Golf Club and Luas. The property is convenient to Dundrum Town Centre, the M50 and city centre. Comprising hall, dining room with bay window, open fireplace, ceiling coving, centre rose and glazed doors to lounge with open fireplace, ceiling coving and centre rose, French doors to rear. The kitchen has a range of fitted units, C.H. boiler and door to rear. Upstairs are 3 bedrooms – two doubles and one single - bathroom with bath, Triton shower, W.C. and WHB. Outside the gardens are extensive to front, side and rear with off street parking to front.